Heralded as the World’s Leading Culinary Destination, not once, but six times, Peru has become the top country to visit for its gastronomy. Peruvian food is a beautiful confluence of cultures that has created a gastronomic experience like no other. 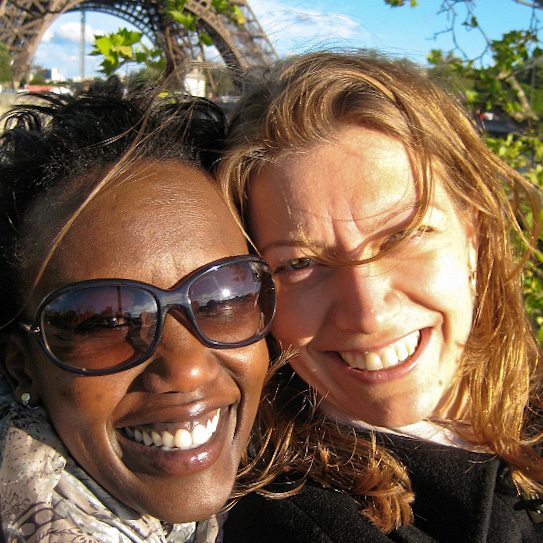 Culinary explorers, Rosemary and Claire from Authentic Food Quest, spent 6 months exploring the local cuisine in South America. They share here some of the unique types of food in Peru not to miss. 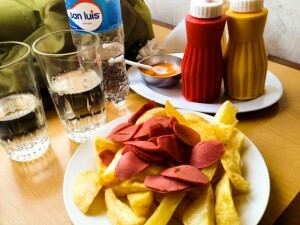 Get started eating your way through Peru with these popular and traditional Peruvian cuisines. The Chinese have a long history in Peru. They were the first Asians to arrive in Peru between 1848 and 1874. As a matter of fact, Chinatown or Barrio Chino in Lima, is the Western Hemisphere’s earliest Chinatown. Chifa reflects a fusion by Chinese Peruvians of the ingredients that the Chinese brought with them and the ones they found in Peru. Peru has the most Chinese restaurants in South America. Only in Peru you will find Chinese food referred to as Chifa. Unlike the U.S, where Chinese food is considered “ethnic”, Chifa is so deeply integrated with Peru that it has become, in itself, Peruvian. In Chinese, “chi” means to eat and “fan” means rice. This is the origin of the famous Chinese Peruvian cuisine. 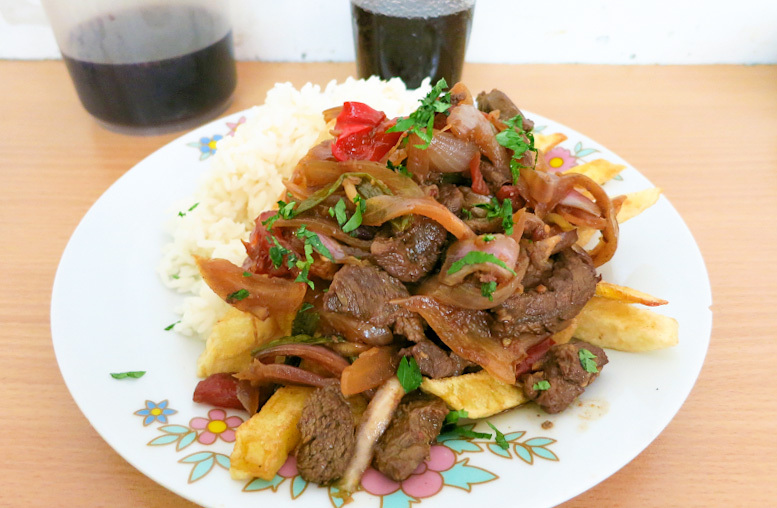 Lomo Saltado, is one example of a traditional Peruvian dish, that is actually a fusion of Chinese and Peruvian food. Strips of beef are stir-fried with potatoes, onions, tomato and ají amarillo and then flavored with a little soy sauce, garlic and cilantro. Although it is served Chinese-style with rice on the side, it has Peruvian potatoes as well. 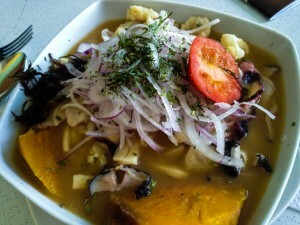 This local and popular dish is one of the best-loved local foods in Peru. Criollo dishes are Peruvian “comfort foods” or the everyday meals Peruvians eat at home. Not to be confused with Creole. In Peru, Criollo refers to the people raised in the coast, mostly in Lima, descendants of the Spanish colonial settlers. This style of cooking mixes native Peruvian ingredients and Spanish cooking techniques with additions from African, Chinese and Japanese cultures. 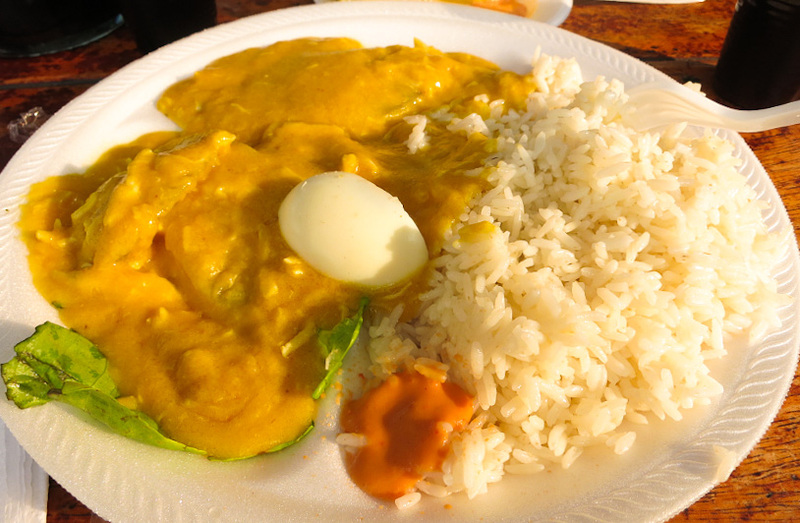 Aji de Gallina is one of the most traditional native Peruvian foods. A fusion of Spanish and Quechua ingredients, this dish features succulent chicken in a mildly spicy creamy sauce. Aji de Gallina gets its color from the yellow ají amarillo chili pepper, one of the must-have ingredients of Peruvian cuisine. The heat of the peppers is softened by a liberal dose of evaporated milk or cream. Savoring the flavors of Aji de Gallina is biting into the cultural fabric of Peru. A truly unmissable experience. You may not be aware, but Peru actually has the second largest Japanese population in South America after Brazil. As a matter of fact, Peru was the first country in South America to set up diplomatic relations with Japan and accept immigrants. At the end of the 19th century, when Japan was pushing farmers to immigrate, 790 Japanese pioneers migrated to Peru with the promise of farm jobs. The Japanese immigrants worked in the fields, mainly in sugarcane plantations, and later on, settled in the cities opening their own small businesses. The Japanese started integrating with Peruvians, bringing their culinary heritage and their own techniques. 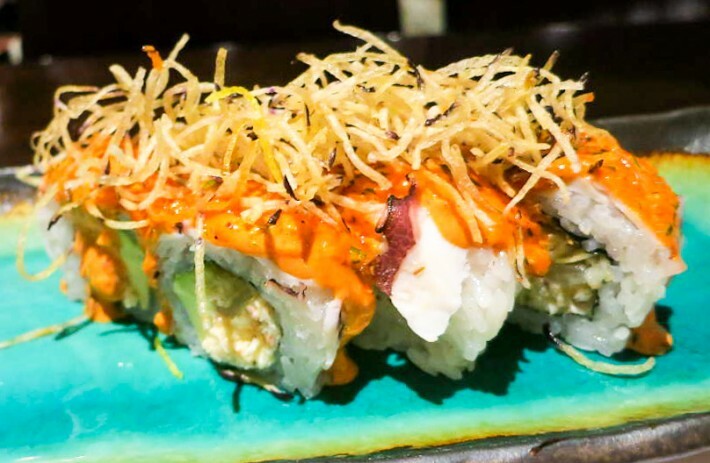 Nikkei cuisine was born as a result of the fusion of Japanese recipes and traditions with Peruvian ingredients. The Japanese introduced new ingredients to Peruvian cuisine like miso, ginger, soy, wasabi, and rice vinegar. 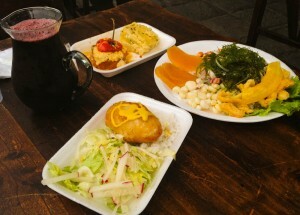 They also integrated Peruvian ingredients such as ají amarillo, Andean potatoes, and corn. This fusion of the two cuisines took place progressively and today, Nikkei cuisine is constantly evolving. 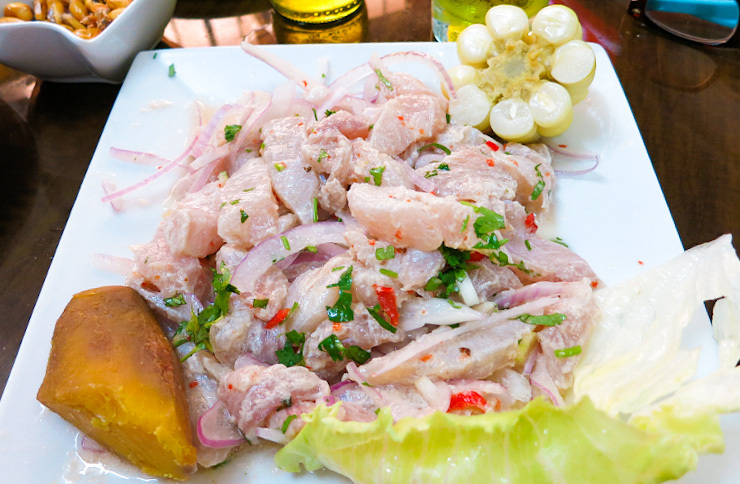 You probably already know ceviche is one of the most popular foods in Peru. The traditional recipe for Peruvian ceviche calls for long hours of marinating fresh fish in lime juice until it is “cooked.” Ceviche Nikkei has a slight twist. Lime is added only for a few minutes on the fish before serving to keep it from “overcooking.” Additionally, ginger and soy sauce are used for additional flavor. Don’t miss the exquisite blend of cultures when you experience Nikkei cuisine. Rosemary and Claire are co-founders of Authentic Food Quest. They aim to inspire travelers to connect to the culture and people through local food. Through food, they believe, travelers can have a deeper and richer connection to a destination. For your travels to Peru, get their recently published book available on Amazon Authentic Food Quest Peru: A Guide To Eat Your Way Authentically Through Lima & Cusco. 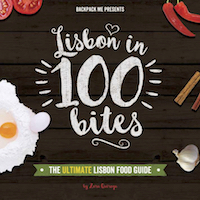 Follow their adventures and get the best tips on where to find authentic food. 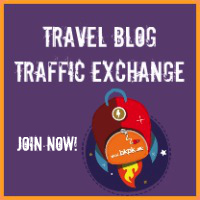 Connect with Rosemary and Claire on Facebook and Instagram! Yummy! I would love to try some! Loveeee Peruvian food, despite never having been to Peru. I really really want to go there to try it for myself! Wow, seems delicious! Thanks for sharing!